Hard to believe summer is just about behind us and fall is on it's way. What a tough, difficult season this was for CT farmers. Very cold, freezing nights in late spring, leading to rain, way way too much rain this summer, followed by extreme hot temperatures and Olympic deer issues just about did our farm in. We lost so much early on, beets, swiss chard, carrots, salad greens, then during the rain, the tomatoes splitting, the heirloom ones rotting on the vine from taking on too much water. We perservered during it all, replanting where possible and things are coming up nicely now for the fall. 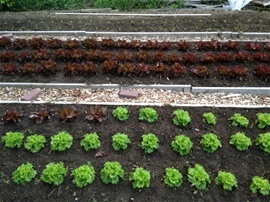 Arugula, swiss chard, lettuces, fall/winter squashes are looking great! 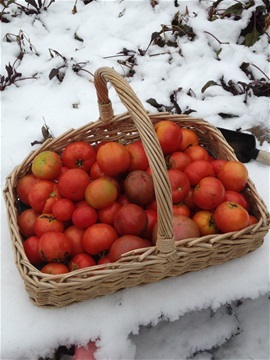 We have opened up the appllication for next year's CSA. Please go to the application page to sign up. Thanks to everyone in our CSA for their patience during this season. Mother Nature prevailed over us this year! Hello everyone. It appears that Spring may FINALLY have arrived and we have left the snow/cold far behind us. We have been incredibly busy these past few months, purchasing new seeds, plant containers, equipment, planning out the garden, fixing the broken fences and posts (thanks to the deer that managed to get herself caught inside and rammed into it to get out), etc. 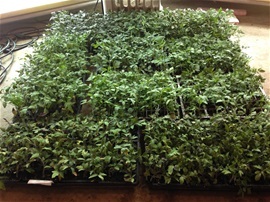 The grow room is very full with over 2000 tomato plants of many different varieies, basil, parsley, kale, beans and more. Our onions, shallots, leeks and scallions just arrived and we are hoping to get them in the ground this week. Our current crop of kale that is in the greenhouse looks fabulous and is ready to go outside in the ground, hopefully by week end. Now Mother Nature has to keep the temperature somewhat consistent and on the warm side for this to happen so keep your fingers crossed. We do have 1 more FULL share left in our CSA. If interested, please go to the CSA section here, fill out the application and mail in with your check by May 10. Posted a few new pics of the kale/tomatoes. Check them out - back to you all in a few weeks with more updates and pics! In the meantime, enjoy the grass growing, daffodils blooming and trees budding! Happy New Year and welcome to Winter 2018! It's never too early to start working on this year's produce. The new seed catalogs have come in and Farmer Bob is once again in his glory, picking out new varieties for this year. Our 2018 CSA application process has begun. We are limited in the amount of shares we have available this year due to past members returning (THANK YOU!!). If you are interested, please go to the CSA page, read up on it, and if it is right for you, fill out the application and return with your check. You will then get 17 weeks of the freshest produce you can get from late June - October. Don't delay! RHS Seniors! If you are interested in spring interning, let us know. We had a great group of 4 last year - the more the merrier. Check out the pictures in the gallery. Cannot believe our 2017 CSA season has come and gone already. 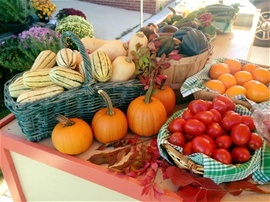 We have 11 days left until we close our Ridgefield Farm Stand for the season. BUT we still have so much wonderful produce left! This growing season was, as most are, challenging. Late spring cold weather snaps pushed everything back a good 3 weeks making our growing season longer now in the Fall. That combined with the warm Fall weather we have been experiencing have produced a lot more tomatoes, our fall greens, and of course our fall squashes. The corn we get from upstate is still going strong too. 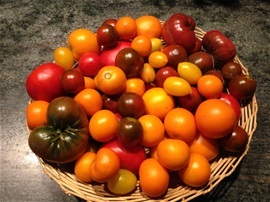 The picture here is of heirloom tomatoes just harvested on Monday - aren't they gorgeous? Keep tuned for more information about our 2018 CSA and the new application. We will begin taking them as of Friday 10/20. Happy New Year to all our friends, family and customers. Hard to believe but we are already in the process of planning out the new crops, locations and what seeds to buy. All the new catalogs have come in and Farmer Bob is just beside himself with glee...highlighters in hand he sits down every night perusing the new varieties of vegetables as well as our old tried and true ones. Our CSA applications process is open for 2017. Don't delay and put off signing up. We have a limited amount of shares available and many are already spoken for. Stay tuned for updates as we proceed with the planning stages. 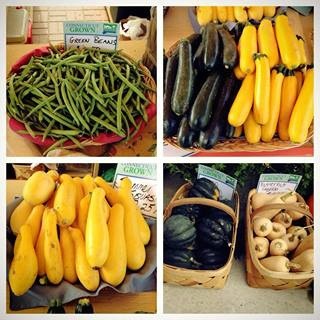 Our CSA for 2017 season is open! There is a limited amount of half shares this year but our full share slots are wide open. Check this site for further information under "WHAT IS A CSA"
Hello. Welcome to the 2016 season of Veronica's Garden. We are so excited to be opening our stands again this year both in Ridgefield and Danbury, CT. Anticipated opening date is Saturday June 25. Of course Mother Nature will have to confirm that but hopefully the warm weather we are experiencing this week (5/23/16) will encourage those plants to grow grow grow! We put up a brand new greenhouse this year and it's spectacular. Have lots of basil, onions, leeks, tomatoes, green beans already growing in there. Bob is busy getting everything else out in the fields from the grow rooms and it's looking terrific. Stay tuned for further updates as to date. And check out the new photos. Thank you so much to all our wonderful loyal customers and so many new ones we met this summer at our stands and Farmers Market, as well as to our terrific 2015 CSA members. The season started off slow, with very cold, wet weather in May and June but quickly progressed. Our bounty was a good one this year..lots of hard work went into it but it all paid off. Tomatoes were outstanding as were the rest of the veggies, beans, potatoes, onions and so on. We could not do it without support of our great customers and staff..so THANK YOU AGAIN and looking forward to a productive 2016 season. 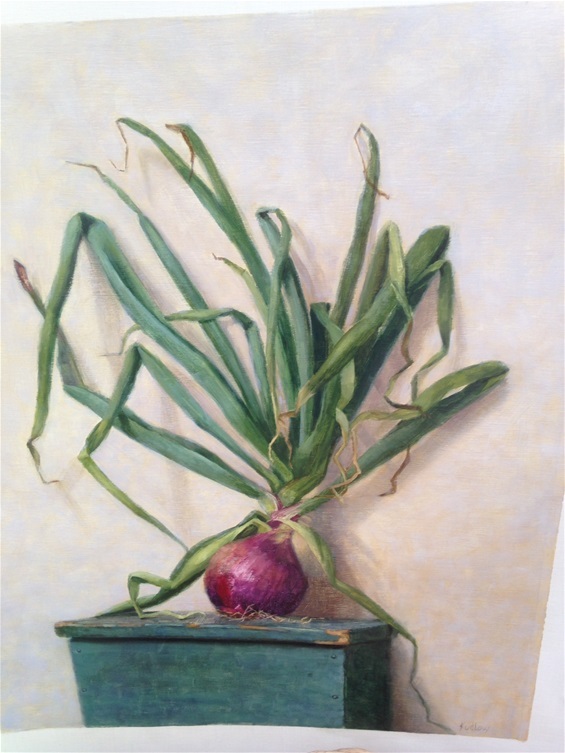 A gorgeous painting of one of our onions b one of our extremely talents customers! 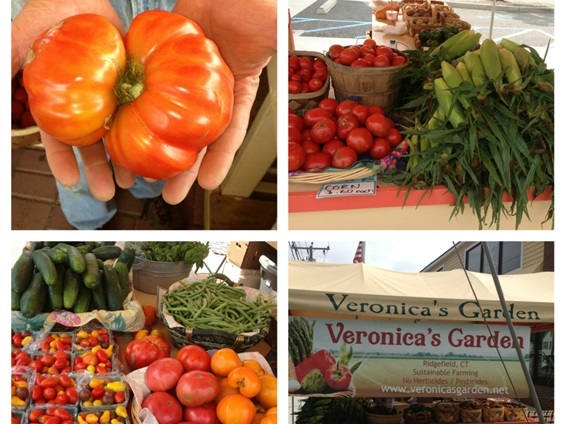 Veronica's Garden is a sustainable farm located in Ridgefield Ct. Bob DiNucci has been farming this land for 19 years, starting it as a hobby and growing the land exponentially over the years. Tho we are not certified organic, we use no pesticides or products containing any harmful chemicals, using only organic materials. Furthermore, we do not use any GMO seeds. 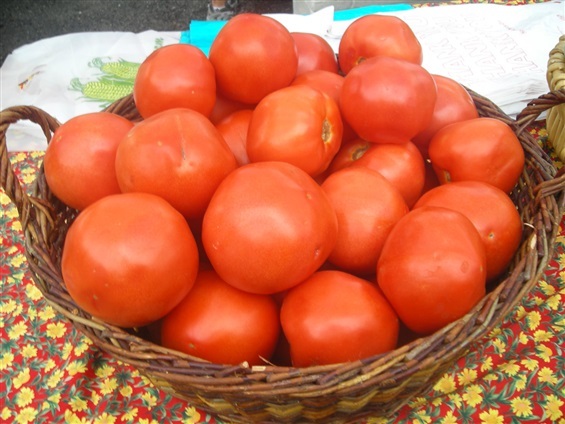 We have two daily farm stands, generally opening late May/early June (weather dependent) through October...32 Danbury Road (Rte 35), Ridgefield located in front of Peachwave Yogurt and 39 Mill Plain Road, Danbury, located in front of Spasi Restaurant. 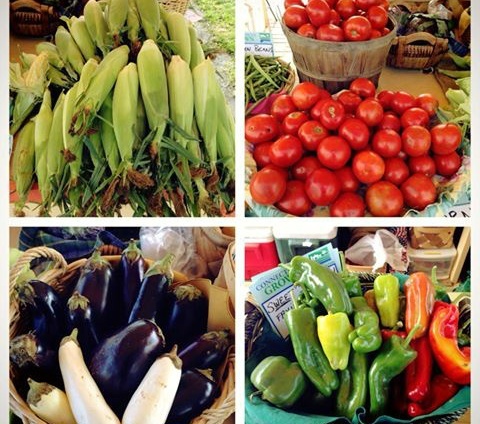 In 2016, we are again excited to be offering a Community Supported Agriculture (CSA) program. Read more about it in the next pages.